Join Gina Glenn and Ana Willis on the Mommy Jammies Podcast where we’ll chat about how to make a difference and a profit at the same time. I believe that learning how to help and support your loved ones who are struggling with anxiety doesn’t have to be overwhelming. And I believe that anyone can do it, one small step at a time. Despite the fact that my husband and I had our own anxieties as children and adults, it was startling for us to realize that we had four bright, gifted children who were struggling to cope with their own as well. Helping our children navigate anxiety and anxious thoughts felt quite different from managing our own. We were filled with so much confusion, doubt, worry, and a fear that we were failing our kids and letting them free fall. We desperately wanted to be able to help them cope and lead healthy lives but we didn’t know where to start. Traditional parenting books and tips just weren’t helpful. Determined to help, we began searching online, reading books on childhood anxieties, seeking professional help, and talking with teachers and other parents. As we dug deeper, we discovered ways to help our children navigate their own path through a variety of situations. We made it through with a sense of strength, perseverance, and confidence. We even started a local support group for other parents in the same situation. Today, our children are thriving, happy, and learning to face, share, and manage their own anxieties. I know you want the same things for your children, and I can help you get there. 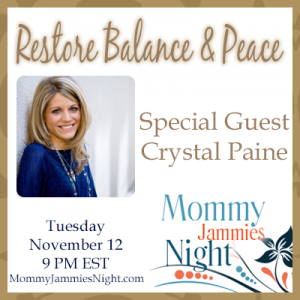 Crystal Paine – Money Saving Mom joins us as our featured guest! Crystal offers help for the weary homeschool mom, with three little ones of her own, a husband and a large blog to manage and maintain, Crystal finds time to pour into her family and she will share these tips with you! Details HERE.